Last November, I wrote a post about deadbeat vanity publisher 2 Moon Press, which closed its doors in May 2013 amid competing claims of wrongdoing by its former and current owners. In the process, it left large numbers of authors in the lurch--many of whom had paid thousands of dollars and never seen a single book. Despite all this, prosecutors initially declined to bring charges against former owner Don Semora (even though, according to news coverage of the situation, he has a prior history of fraudulent activity, and has served time in prison) or current owner Melinda Lundy. That changed when a local news channel produced an investigative segment on 2 Moon Press's demise (well worth watching, if only for the confrontation between Melinda Lundy's son and the reporter, in which a camera gets smashed). As a result of the segment, the case has been re-opened. In addition, a number of 2 Moon Press authors are trying to recover their lost resources through civil action. They've filed a lawsuit against Semora, Lundy, and 2 Moon Press alleging breach of contract, unjust enrichment, fraudulent misrepresentation, and other charges. They are seeking damages, interest, costs, and attorneys' fees, as well as the return of their materials and property. (The full complaint can be seen here). These authors have lost thousands of dollars to 2 Moon Press, and none of them were wealthy to begin with. Coming up with money for legal fees is very tough. So they're asking for the public's help with an IndieGoGo campaign called Justice for Authors. Their goal is $15,000, and as of this writing, they have 17 more days to raise it. I'm not in the habit of asking my readers to support crowdfunding campaigns. But these authors have lost so much, and even though it now seems possible that charges will be brought against Semora and Lundy, such cases, even when successful, rarely result in much in the way of restitution. Please take a look at Justice for Authors. Support it if you can, and even if you can't, please spread the word. Amazingly--or maybe not--Don Semora has formed a new company, Fall River Publishing and Graphics, LLC. 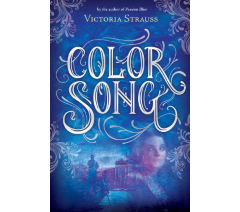 I often hear from authors wondering what questions they should be asking when they receive The Call--the agent representation call, that is. How can you be sure if this particular agent is really right for you--if his plan for your manuscript matches your goals, if her style is a good fit for your needs? Well, of course, the answer is...you can't, not completely. No matter how many questions you ask or how much research you've done, there's no way to know everything, or to predict the future. The best manuscripts sometimes fail to sell. The most promising relationships sometimes wind up on the skids. When you sign with an agent--even if he or she is your dream agent--you're launching yourself into the unknown. You can, however, do your best to be prepared and informed. Following are some resources to help. - First, an important caution from agent Steve Laube: Really, You Don't Have to Ask. Steve identifies a number of questions that often appear on "questions to ask a prospective agent" lists, but which you really should not need to ask, because you will have done your preliminary research. These questions are good ones when asked at the very first stages of considering an agent. But the answers can be found so easily on your own that to ask them after you’ve gone through the submissions process shows the agent you didn’t do any homework. She may wonder why you chose her. 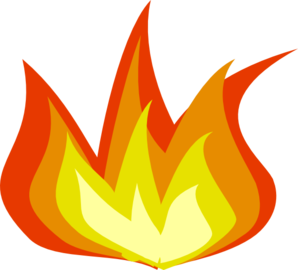 - Literary Agent Offers: Don't Settle! This post from author Sarah Ockler is a few years old, but still very relevant. Rather than specific questions to ask, she identifies important areas that you need to craft questions to learn more about, such as communication style. Sarah's post also includes helpful tips on recognizing the warning signs of a bad agent. - When Agents Offer Representation... This advice from AgentQuery includes not just a list of questions to ask a prospective agent, but suggestions for what to do in multiple offer-related situations, such as receiving an offer while still waiting to hear from other agents who are reading. If you get an agent who is unwilling to answer questions or seems to balk at these basic ones, that would be a red flag for me, personally. Communication problems and transparency are big issues in a writer-agent relationship, and if there are issues from the word “go,” the situation is unlikely to get better. ...you probably won’t want to ask all of [the questions]. Choose what’s most important to you...Also, there aren’t necessarily “right” answers to all of these, because there are many legitimate ways for agents to do business. Your main goal is to be informed so you’re not surprised by something later. "What is a Schmagent?" You ask? A Schmagent is someone who claims to be a literary agent, but has no real skills, work history, clients, sales, contracts, or resources. It's not like pretending I have a medical degree; I can't go around saying "I'm Victoria Marini, M.D." because it's crazy illegal! But anyone can say "I'm John Doe, Literary Agent." - 25 Questions to Ask Your Potential Agent: Agent Wendy Lawton suggests questions not just for The Call, but for other scenarios: agent panels at conferences, and changing agents at a later stage of your career. 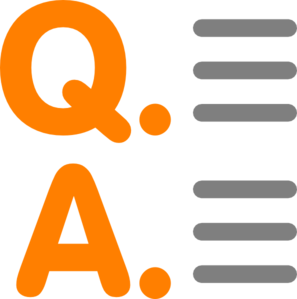 - The Association of Authors' Agents (the US literary agents' membership organization) has created a helpful FAQ, including some of the more technical questions you might want to ask. - The publishing world is in the midst of a massive paradigm shift. I know--not news. However, all this change affects the author-agent relationship. In A New Digital Dialogue for Agent Representation, agent Carly Watters suggests questions that reflect the realities of the new world of digital--including digital imprints and self-publishing. As self-publishers, we have built our readership and already have a following. Our e-rights are very valuable to us and we're not keen to bundle them with other rights. We expect publishers to understand that our situation is different -- and to reflect this in their contractual terms and conditions. Ultimately, I think the most important thing--once you've asked the practical and technical questions, and satisfied yourself that the agent really is enthusiastic about your work--is to figure out whether you feel comfortable with the agent, both personally and professionally. Your agent doesn't need to be your best friend. But you shouldn't feel awkward or intimidated, and you shouldn't have any niggling doubts about how s/he sees you and your work or how s/he intends to market it (and you). Pay attention to your gut feelings. I do know how hard that is, especially if you've been querying for a while and this is your only offer. But I hear much too often from writers who allowed their dreams to override their doubts, and later came to regret it. 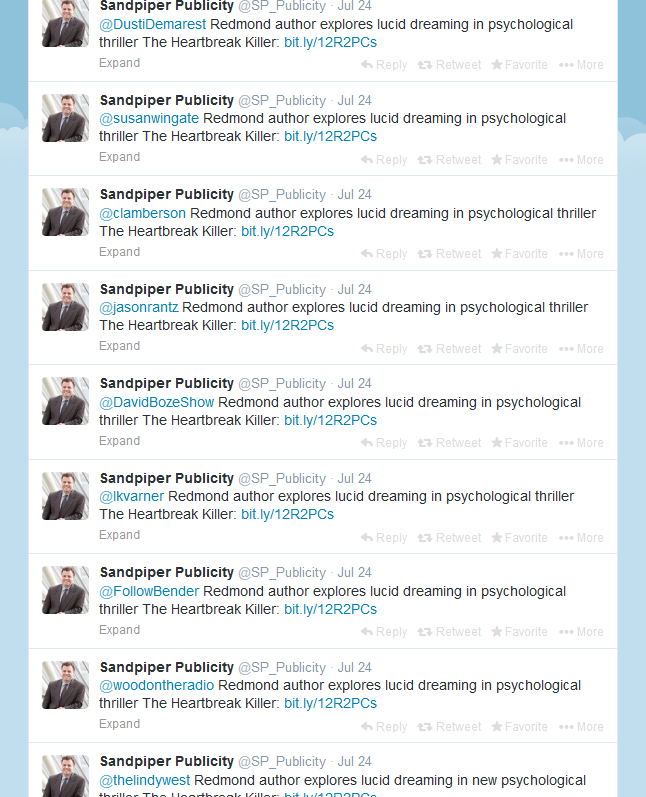 A while back, I wrote a funny post about a "literary agent" who popped up under one name, then another, then a third. To give you the gist...In 2009, I began hearing from writers who'd submitted to a Boston-based literary agent called Sara Levine, only to be contacted by Levine's supposed assistant, who told them that Levine had died suddenly of a heart attack and referred them to Levine’s colleague, Julia Levin of the Florida-based Julia Levin Literary Agency. However, things about Julia Levin didn't quite add up. None of her clients were published. Her sales claims didn't check out either, and the physical address she gave for her agency turned out to be bogus, as did the agency where she claimed to have trained. The weirdness of Sara dropping dead and Julia emerging out of thin air began to look even weirder--could Sara and Julia, with only an “e” of difference between their last names, possibly be the same person? Writers began to smell a rat, and to say so in public. Eventually it all got to be too much for poor Julia. Within a month, she'd vanished from the Internet. A few weeks later, I started getting questions about another Florida-based agent called Drew Montgomery, of Drew Montgomery Literary Associates. Drew's online presence exhibited exactly the same inconsistencies and falsehoods as Julia Levin's (including a telltale mis-spelling of the name of publisher Houghton Mifflin)--and within a few days, I found out why. The owner of an agent-tracking website emailed me to say that he'd been recently contacted by the now-vanished Julia Levin about a listing, which he refused because she couldn't prove she'd made any sales. About a week later, Drew Montgomery approached him with the same request. Since she couldn't prove any sales either, he gave her the same response. But he happened to notice something odd: Drew's IP address was identical to Julia's. Bingo! Outed here and at Absolute Write, Drew vanished too (though not before reappearing as Julia Levin in a bizarre attempt to impersonate one of Drew's clients). 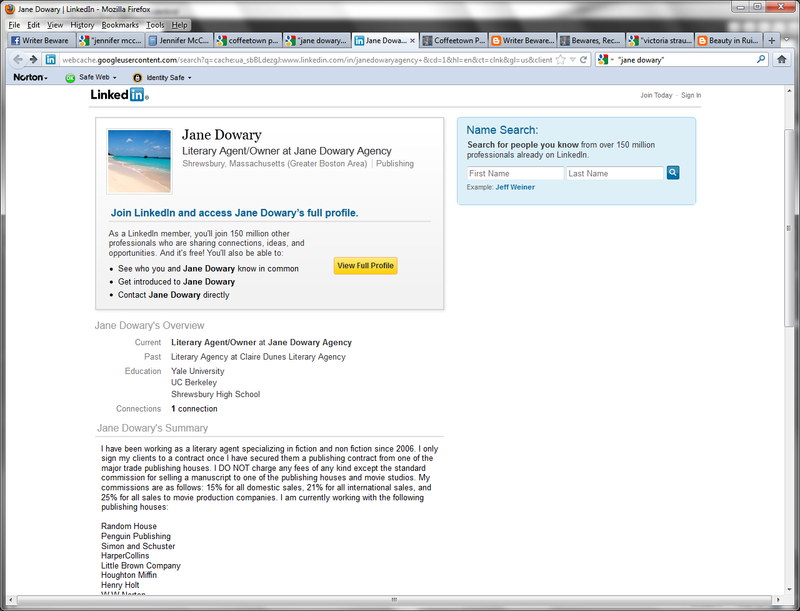 Enter Jane Dowary, of the Jane Dowary Agency. I first started hearing about Jane in April of 2012, from writers whose work she'd submitted inappropriately or to whom she'd given bizarre writing advice. In at least one case, I'm convinced, she fabricated an editor's comments. Note Jane's claimed location (Boston area) and her claimed education (Yale, Berkeley). Note also the mis-spelling of "Houghton Mifflin" as "Houghton Miffin"--a telltale mistake made by both Julia and Drew--and the agency at which she claims to have trained, which, like the agencies claimed by Julia and Drew, does not appear to exist. Based on these things, as well as on Jane's M.O. as reported to me by clients, I was pretty sure that this was Julia, or Drew, or whatever her name was, in yet another guise--although I couldn't prove it. So should she get points for coming clean? Not so much. 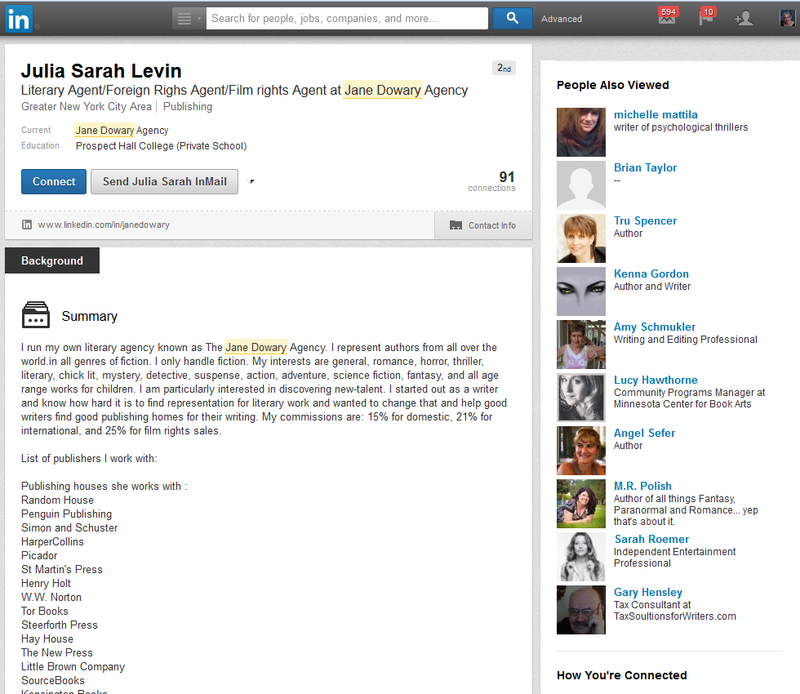 She's still lying about her agency's startup date (early 2012, not 2013 as claimed on her website). She still doesn't have any relevant experience that would qualify her to be a literary agent, and, apart from one book placement with a small press that doesn't typically work with agents, she still doesn't have any sales. When I asked her the same question in private email, she told me "I kept changing names because I wanted to have a agency that was free and clear from all of this so that I could earn people's trust and respect and become a legitimate and successful agent and actually get novels published for my client." In many ways this is a sad story. I think some kind of pathology is at work here, with the repeated name changes and the serial lying. Whoever Julia is, she seems to be a troubled individual. But she's not someone who should be acting as anyone's literary agent--and, judging by the number of questions I'm receiving about her, she is reaching out to authors. The Bookseller Takes a Stand: No More Advertising From Author Solutions, Inc. I've written many hundreds of words on this blog about the problems with Author Solutions, Inc., the biggest of the self-publishing service providers and the one with (as far as I'm aware) the worst reputation. Misleading PR strategies, overpriced marketing services, customer service nightmares, payment issues, relentless upselling--the list goes on. Author Solutions is currently the focus of a class action lawsuit for alleged deceptive business practices. Author Solutions has a variety of (what they call) Bookseller Magazine packages – ranging from £2,199 (approx. $3,300) to a jaw dropping £6,999 (approx. $10,500). When you see how many books they squeeze into one page, it’s clear that this is quite lucrative for them. I don’t know what The Bookseller charges for ad space, but I’m sure Author Solutions are adding a significant mark-up (as they do with all their services). But now--good news. 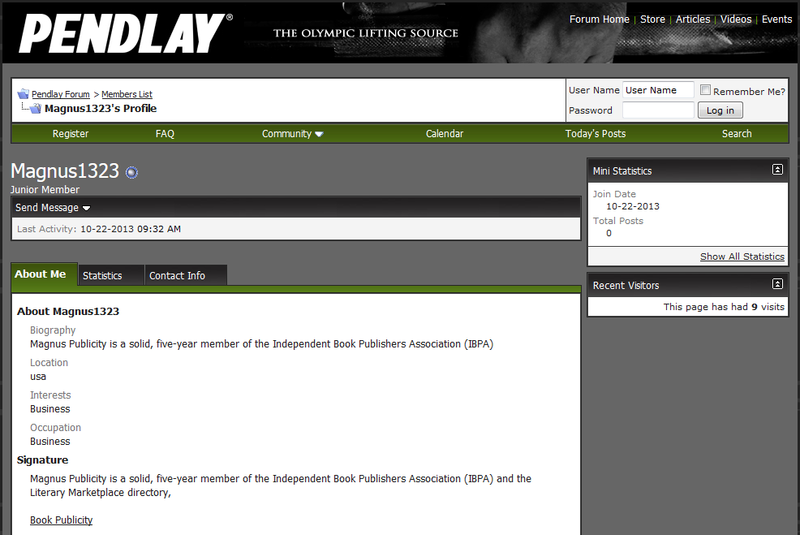 Gaughran has announced on his blog that The Bookseller will no longer accept Author Solutions advertising. The Bookseller is no longer taking advertising from Author Solutions or its subsidiary companies. We’ve previously asked them to update the information they display about us on their websites, and have now asked them to remove it entirely. Advertising packages with The Bookseller were just one of many such packages that Author Solutions re-sold to its customers at eye-watering prices. You can still buy packages to advertise with the London Review of Books, Guardian Weekly, Library Journal, Kirkus, Publishers Weekly, New York Review of Books, Readers’ Digest, ForeWord, Clarion, Ingram, and the New York Times. So there's much more that needs to be done. Writer Beware joins David Gaughran in calling for these publications to follow The Bookseller's example, and stop taking money from a company whose advertising is little more than an exercise in author exploitation. In fact, I'll go further: I'll call on ALL publications to stop taking ANY ads from self-publishing services and pay-to-play publishers where authors must pay to be included. Whether the ads are from Author Solutions brands or Outskirts Press, Bookwhirl or New Generation Publishing, these are exploitive packages that do not benefit the writers who buy them. [A]sk Publishers Weekly when they are going to stop taking ads from vanity presses, ads which Author Solutions re-sell for $16,499 to authors. Email them and ask them. Even better, confront them publicly. Hound them on Twitter. Annoy them until you get a response. Post it on your Facebook Page. Post it on their Facebook Page. Ask the LA Times Festival of Books what they think about Author Solutions scamming writers out of a million dollars at their event. Ask them on Facebook and Twitter what they are going to do to stop that happening again this year. Ask all the companies listed above about their links to Author Solutions. Then ask the Authors Guild when they are going to break their silence on this issue, why the only advice they give on self-publishing is a package with iUniverse, and if they receive any financial benefit from such referrals. Before I start, let me emphasize that what follows is my own personal opinion. I'm not speaking here for anyone but myself. Many of you may be aware of the controversy that erupted last year over the content and format of SFWA's quarterly publication, the Bulletin. This resulted in the Bulletin's temporary suspension while a task force appointed by SFWA's then-President, John Scalzi, investigated the Bulletin's role within the organization, with the goal of recommending changes going forward. Over the past week or so, controversy has engulfed the Bulletin once more, with a petition circulated by former SFWAn Dave Truesdale protesting "politically correct censorship" of the currently non-existent Bulletin. (It's also worth reading the original, much more wordy, version of the petition, which can be found here.) Among the 30 or so signers of the petition are a number of eminent speculative fiction authors. Current SFWA President Steven Gould has posted a response. I'm not interested in addressing any of the allegations and counter-allegations over the petition (which in any case is protesting an imaginary issue: there's no Bulletin "review board", nor is one planned). What concerns me is the by-now predictable SFWA pileon, with commentators (many of them not SFWA members) tut-tutting about how backward, sexist, and juvenile the organization is (here's just one example). What value, many of these commentators demand, can SFWA actually offer writers, dominated as it is by flame wars and trumpeting dinosaurs? For me--and again, I emphasize that this is my personal opinion--there is another way to look at this. Truesdale's petition, as well as the earlier brouhaha over the Bulletin, are actually symptoms of something positive: namely, SFWA's long, slow journey of transformation from an advocacy organization with its roots in the insular, clubbish spec fic community, to an open, modern, professional writers' group. I wish this transformation were proceeding faster, because many younger SFWA members, as well as new writers who should be interested in joining, are alienated by the clubbish, fannish atmosphere that still dominates SFWA's public persona (including the Bulletin before it was suspended). But it is happening--the overhaul of the Bulletin is just one instance of that--and many older SFWA members, especially those who may feel they're being left behind by the huge shifts that are changing the face of publishing, are fighting to keep SFWA the way it always has been, and are angry and resentful that they're losing the battle. I think the petition is a symptom of this. I think that many of the signers were still furious over the original Bulletin controversy, and saw the petition as a way to express that anger--which basically is anger over the ways in which SFWA is changing...and must change, if it is to remain relevant. These are just some of the educational, advocacy, outreach, and support activities SFWA conducts. Unfortunately, because they mostly happen quietly and efficiently, they get much less press than the flame wars. I am a strong supporter of SFWA. Without SFWA, Writer Beware could not exist--and I'm not just talking about financial and logistical support, but about SFWA's staunch and unwavering backing of Writer Beware and its mission over the years. But Writer Beware isn't the only reason I believe in SFWA. I see great value in the organization, and I know that it is filled with good people whose priorities and views are in no way represented by this latest controversy. Despite the upheavals and flame wars and bumps in the road, I do believe that SFWA will find its way in its long journey of change, and will provide value for writers for years to come. I’m 0000 0000 6755 1414. 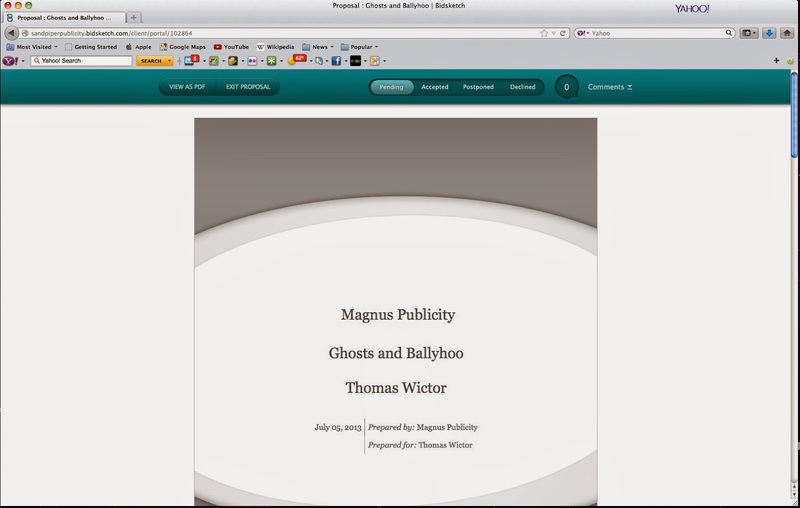 One of my causes is the creation of a system that would make it easy for authors to be identified and found, partially so that the publication of new editions or derivative licenses could be negotiated, but increasingly to protect these works from being declared as “orphans” and being appropriated if their authors or other rightsholders can’t be located. To me, it seems like the problem of works which are still under copyright, but whose authors cannot be found, is to make it easier to find them. There were already a number of library-related systems for identifying authors and disambiguating authorship in existence. They are generally referred to as authorities (not what it sounds like; the name is derived from “author,”) but none of them are exactly authoritative. In fact, the authorities are a bewildering tangle of cross-references, assumptions, and links to places like Wikipedia, from which much of their information seems to derive. You have to be a librarian to appreciate them, I suppose. They tend to be created, maintained, and updated by the library trade, and one can see how they’d be useful to it. One would think that they’d be the ideal system mentioned above. Want to find an author? Just use an authority! There are two problems, though. The entities most likely to be able to identify an author and disambiguate which works were written by him or her and not someone else with the same name is – surprise – the author him or herself. Yet virtually none of these authorities include authors directly in the process of compiling their data. So why am I focusing on ISNI as opposed to say, Library of Congress Authorities or Worldcat? ISNI seems to be focused more on identifying people rather than their works, and is designed to consolidate data from those other systems. I was already in their database, and was pleased to find out that it was comparatively easy to modify my entry when I discovered a few mistakes. It was not instantaneous, however, and the actual updating was done by the “ISNI Quality Team.” Most importantly, although I wasn’t able to attach my email address to the listing, they did include the URL of my website, which is the next best thing to find me. Here’s my listing. Unfortunately, at this point, there are still many gaps: missing authors and missing books. For some reason, Victoria’s main entry at ISNI only lists the Czech edition of The Burning Land, despite the fact that the sources it links to list many more. My entry was missing only one book, but I noted at least one author who has the same name as me, and has had a number of books published through Authorhouse, was not there at all. Clearly, there is a need for authors to create or clean up their own entries. I am encouraged that ISNI’s system has much potential. There are questions remaining to be answered, however. The most problematic is who actually qualifies as an author under this system. ISNI claims to already have over seven million entries, most of them taken from other authority databases--but there’s only one way to find out if you’re there or not, and that's to use ISNI's search function. If you’re not there, the whole process becomes more difficult. 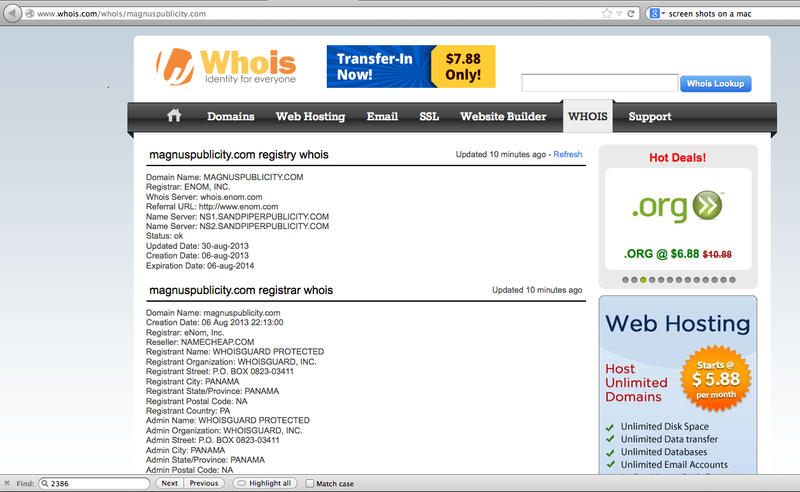 You must register through Bowker, the for-profit company that manages ISBN’s, among other things. But will they allow any author to create or modify their own ISNI, or will there have to be some proof of authorship, such as a book or article already somewhere in the system? Will you need an ISBN to have your book placed on your page? Edward Hasbrouck of the National Writers Union, who is an author advocate par excellence, has many problems with ISNI, which he has detailed in an open letter. He feels that ISNI has an obligation to involve authors proactively in the creation of their entries--but I won’t try to summarize. Read Edward’s post for yourself. The next step, I believe, is for ISNI to engage directly with author groups and communities to solicit authors to come and correct errors and provide additional information, including websites and contact information. Only time will tell if ISNI can live up to its potential and become a useful author information and location tool. Note: This is the first of an occasional series of posts about author information databases. As a result of this post, I'm getting many emails from authors who believe they are contacting PublishAmerica/America Star Books. Writer Beware is not connected in any way with PublishAmerica or America Star Books (in fact, they sued us, unsuccessfully, for defamation in 2014). PublishAmerica has a new name: America Star Books. The PublishAmerica URL (www.publishamerica.com) now defaults to the America Star Books website. America Star Books used to be known as PublishAmerica, the no-nonsense, hard driving pioneer that changed the American publishing landscape for good when in 1999 it forced an opening for tens of thousands of American authors to join what was until then an elite status of being published for free. Some of the material from the PA website has been ported over, such as the Facts and Figures page, but overall the new site is much leaner than the former one. Not only do we continue to publish, for free, tens of thousands of American and Canadian authors, but to that we add a unique mission. It is our mission to translate into English books that Americans have never heard of, from languages that most Americans don't speak. 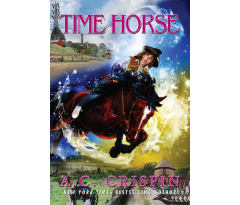 America Star Books gives foreign authors an English voice, and publishes their work in the United States, Canada, and Great Britain. For more information about PublishAmerica, see Writer Beware's Alert. UPDATE 3/23/16: In May 2014, America Star Books/PublishAmerica sued me for defamation, in part on the basis of this post (the complaint named Writer Beware and two additional WB staff members, but I was the only one who was ever served). After my lawyers submitted interrogatories and discovery requests, ASB contacted us to ask if we'd consider settling. A final settlement was signed in January 2016, in which ASB agreed to stipulate to Dismissal With Prejudice. A full report is here. UPDATE 8/14/17: Mired in lawsuits, liens, and management shifts, America Star Books now appears to be defunct. See my blog post for a full report.